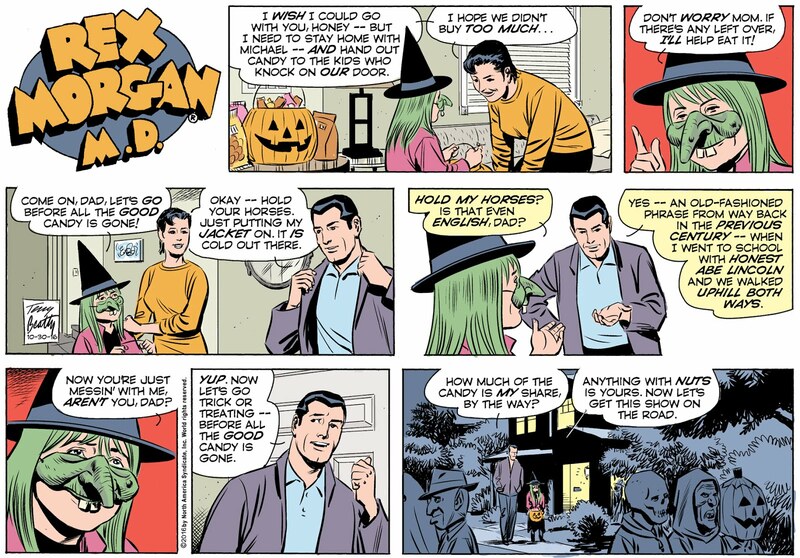 Here are the Rex Morgan strips from late November to mid-December. The first Sunday page is another seasonal stand alone strip. It doesn't advance the story any -- just establishes the time of year and lets me work on showing Rex and Sarah and how they relate as father and daughter. And gives us a little happy moment before the next storyline starts. The snowmen are a tribute to the late Richard Thompson, artist of Cul de Sac and the still-with-us Bill Watterson of Calvin and Hobbes fame. I just wanted to tip my hat to Richard and acknowledge his remarkable work and his unfortunate passing. His pal Bill seemed an appropriate addition. as a baby, except create a reason for June to stay home on extended maternity leave. It'll take a couple more years to get him where I want him to be for more interaction with Sarah and acting as a full character on his own. The first birthday crept up on me mighty fast -- so I'm glad I didn't miss it somehow! The several days of getting Sarah ready for school were designed to lull the readers into a false sense of security -- "Nothing's happening!" they whined -- and then, BLAM! Sarah's accident in the Saturday strip. Don't assume I don't know what I'm doing, folks. I had initially planned to have Sarah in a car accident -- unbuckling her booster seat's belt to pick up a dropped book or something, at the same time a truck skids on the icy road and hits the car. June would have been driving -- Michael in the car, too. But because of her unbuckled belt, it's Sarah who is injured. 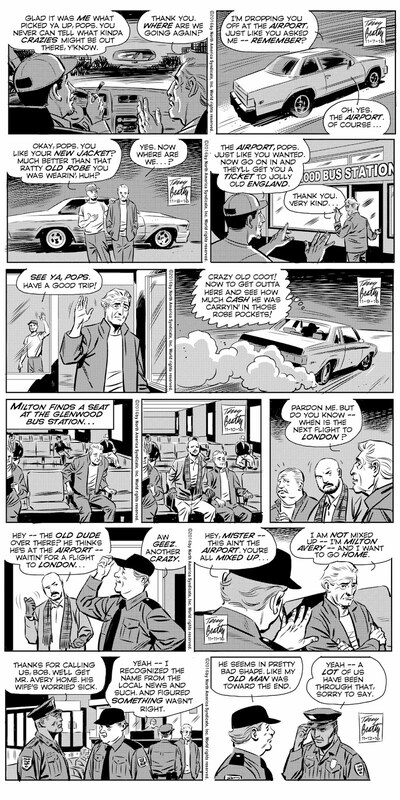 And then there was a big ol' car accident sequence in Judge Parker. Considering that JP is Rex's "sister strip" and runs in a lot of the same papers, I felt I needed to switch gears. I had recently seen some disturbing videos of cars running school bus stop signs, nearly hitting kids -- in some cases they did hit kids. Gears switched. Sarah's accident came at an unfortunate time for one of our subscribing newspapers. 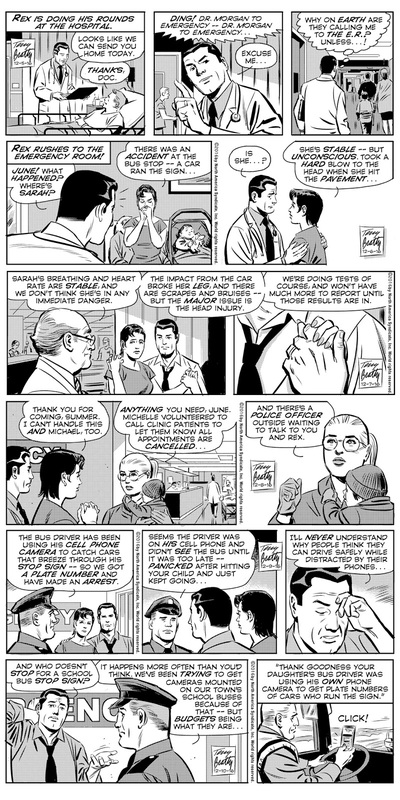 There had been a deadly bus crash in Chattanooga just the week prior to the scheduled running of these strips. Though the Rex story does not involve a bus crash, it still is a bus-related accident, and the paper felt it would be too upsetting to local parents to have this sequence run there. I support their decision to drop the last panel of the Saturday strip and the entire Sunday. There is no way to predict this sort of thing -- all you can do is respond. I had already tried to draw the sequence without exploiting the violence of it (not actually showing Sarah being hit) and in the hospital sequences cut way back on what would really be happening with Sarah -- explicitly to avoid triggering upset in parents who may have gone through this sort of thing. Trying to keep it all "soap opera" and non-specific. All on purpose. And still, we had a problem. One mea culpa here -- at this point I should have been drawing Michael in a toddler stroller, not the baby carriage-style stroller shown here. He's too big for that. My bad. Also some have questioned Sarah riding a public school bus to her private school. Well, there are communities in which there are "ride to school" programs in which students at private or charter schools ride public school buses to school -- the parents pay a fee for the service. I didn't feel the need to explain that in the strip, since it's not really a story point, and kind of a boring detail. Some readers complained about the panel with the bus driver using his cell phone camera to snap pics of cars running the stop sign -- concerned that he should not be using his phone while driving. Um... folks -- the bus is stopped. The stop sign would not be out while he was driving, and he would not be using his cell while driving. I was going for a little irony here -- the accident being caused by the driver of the car being on his cell phone -- and a cell phone also being used to identify the car. Dolly and Bugsy make their return to the strip, as we reveal the truth about her daughter. 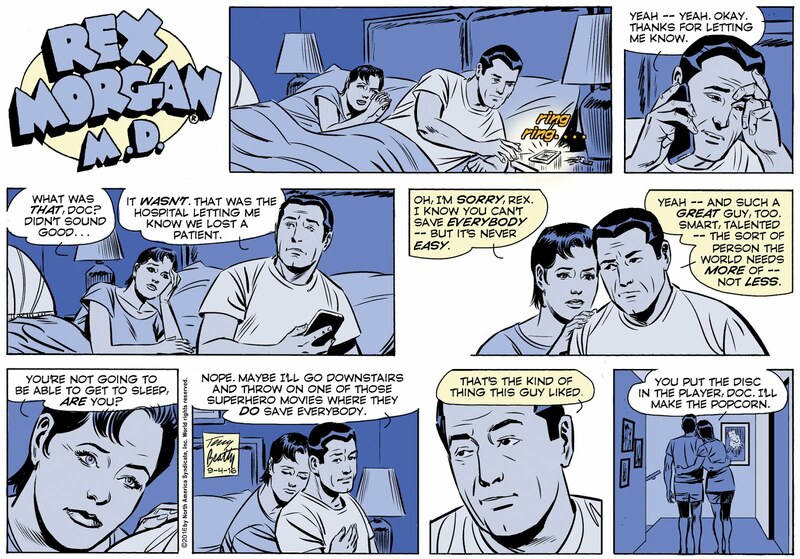 I faked out most of the readers, who believed the daughter had died -- but I never once said that in the strip. I said she was "lost," "gone," but never dead. Also some readers complained that I had drawn the school bus with a stop arm. No -- I had drawn it with a stop sign -- the stop arm is a six foot long contraption with a stop sign attached that helps keep traffic from passing the bus. Not at all what I drew. Again, I do know what I'm doing, folks (baby carriage excepted). The book Dolly is reading on 12-13-16 is Guild, a excellent Western by my late friend Ed Gorman. I wanted to acknowledge his passing somehow, so worked in a plug for one of his books. If you enjoy a good mystery or Western novel, go search out something by Ed, would you? He was a hell of a writer. 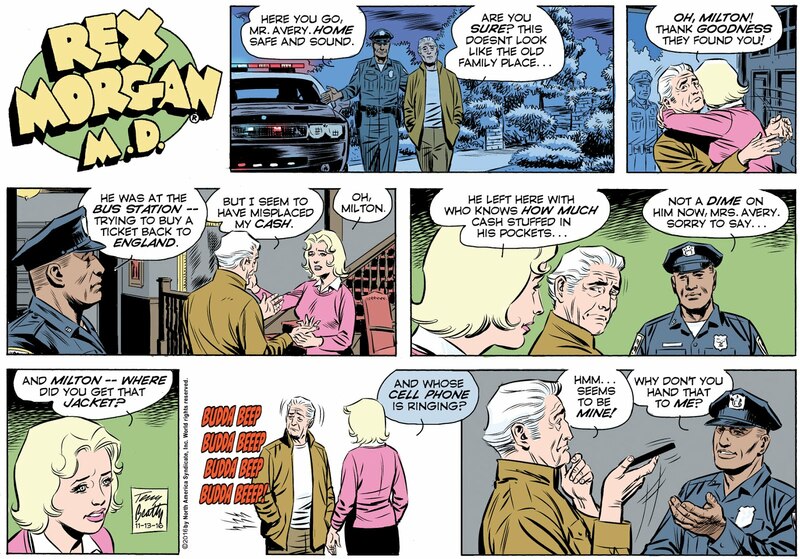 I've been lax, once again, in posting my REX MORGAN strips here on my blog. What can I say? I'm a busy guy. Anyhow -- we'll catch up in this post. I've not been posting my PHANTOM Sundays here lately -- you can see them on King Features' COMICS KINGDOM website, so I don't think I will be posting them here any more -- but the black and white REX dailies are not available at CK (except in a Spanish language version) -- so I'll continue to post the REX strips, so the gray-toned art version can be seen by my fans who don't get REX in their local newspaper. 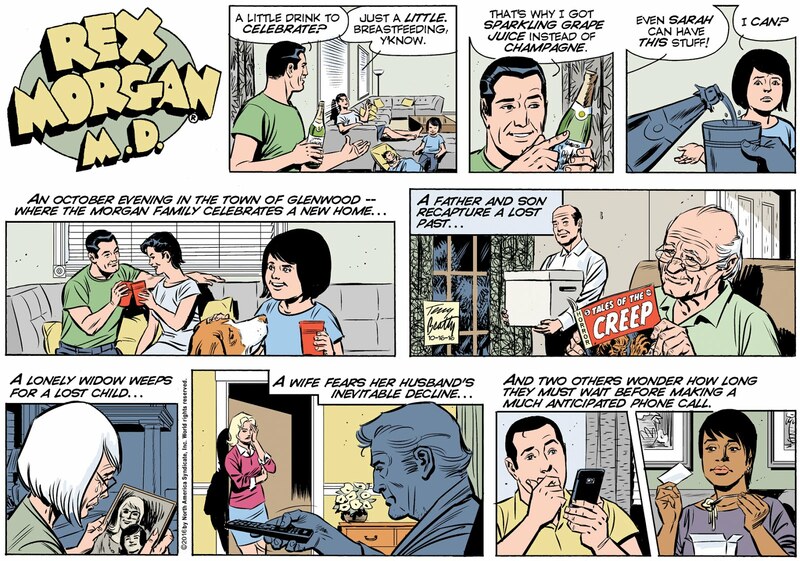 In these strips, we see the Morgans moved into their new home, the beginnings of a romance between Jordan and Michelle, Sarah's Halloween -- and Milton taking an unfortunate walk. 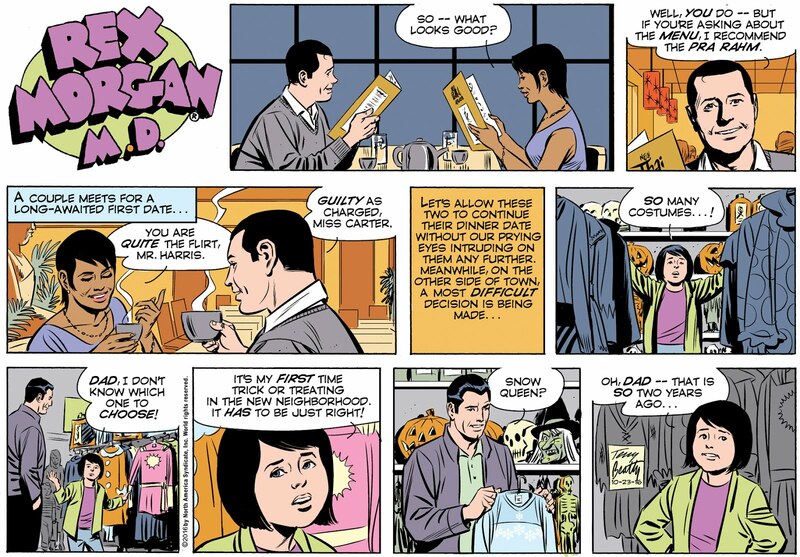 This batch ends with a Thanksgiving strip, and a brief check in with Bugsy and Dolly -- we'll be seeing more of them soon. 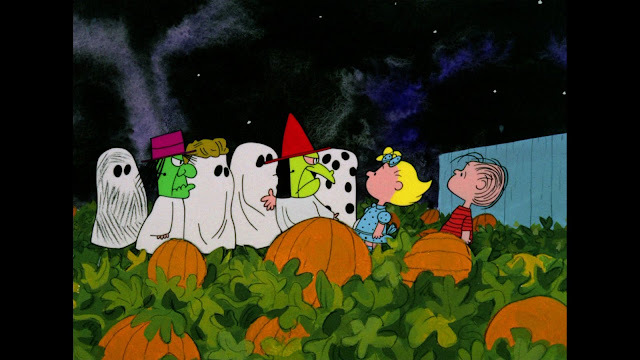 Woody Wilson didn't write seasons or holidays (except a non-continuity Christmas strip) into the feature, for reasons of his own. But I wasn't going to pass up the opportunity to do a Gasoline Alley inspired leaf raking Sunday page when autumn arrived (see the 10-2-16 Sunday in my previous blogpost), or send Sarah trick or treating (even if it wasn't anything resembling a story), and celebrate the first snowfall (check in on the Comics Kingdom site this coming Sunday). Yes, some folks live in places where these seasons don't happen -- but I feel they are right at place in the old fashioned setting of the Morgan's hometown of Glenwood (in some state somewhere in the US of A). 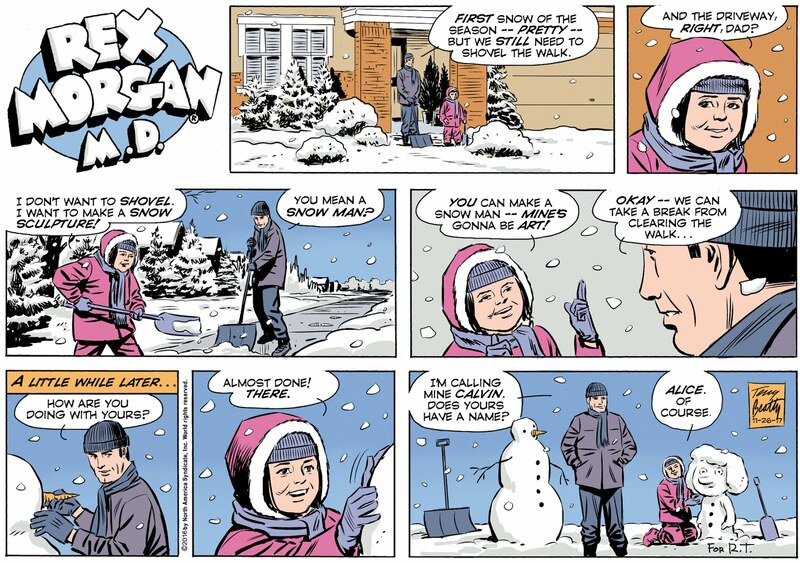 And in collecting examples of early REX strips, I've found plenty of winter/snow sequences in the Nick Dallis-written version of the strip, so I feel justified in bringing back the change of seasons to the feature. I couldn't resist a couple visual in-jokes on the 10-30-16 Sunday page. In the last panel, the trick or treaters on the left are inspired by some of the kids in "It's the Great Pumpkin, Charlie Brown," and the trio on the left are wearing the cursed masks from "Halloween 3: Season of the Witch!" 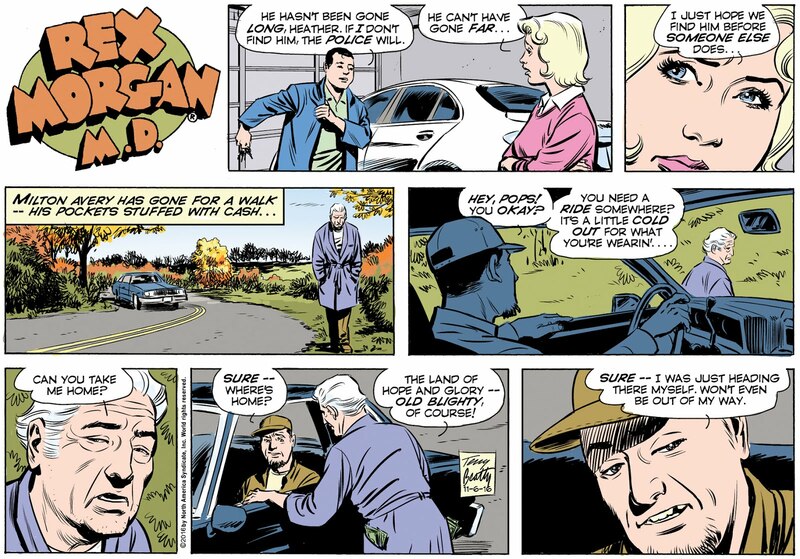 And now -- here's a big batch of REX MORGAN. June finds THE house. 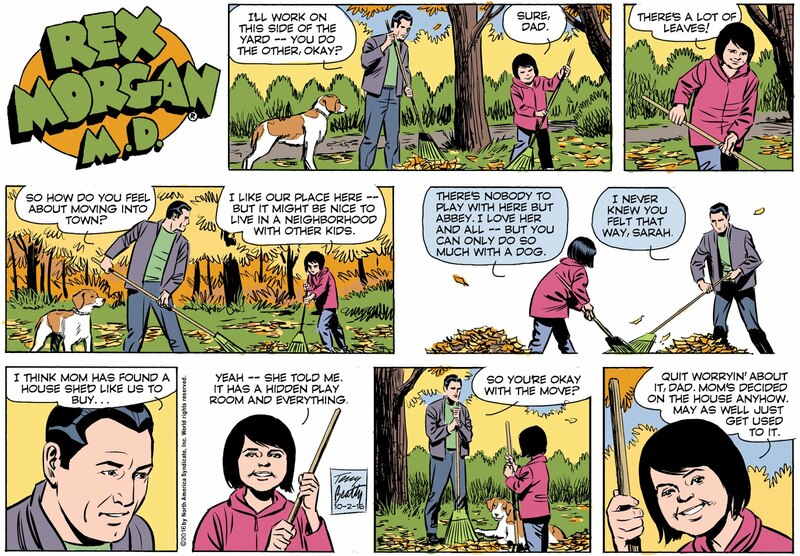 Rex and Sarah rake some leaves, as the seasons change in REX's world for the first time in years -- a house is purchased, another is sold and moving day arrives. 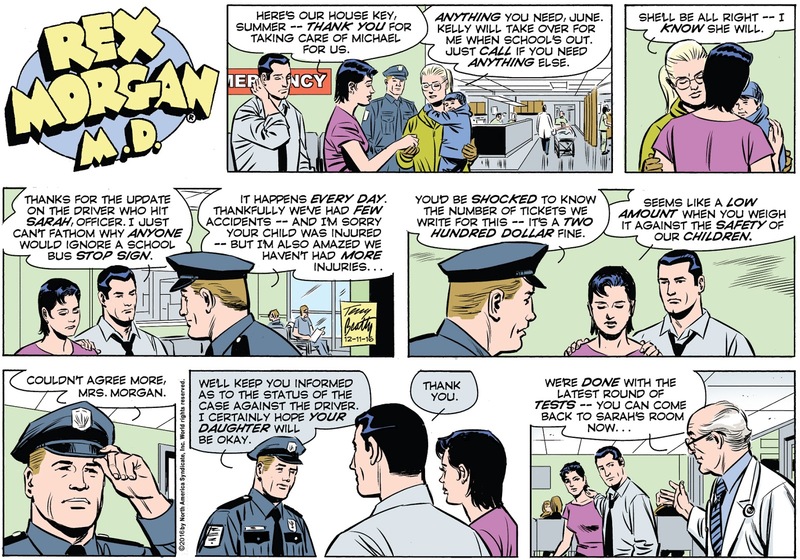 A few notes about this week's strips -- the unnamed patient in the 9-15-16 strip is clearly black in these toned dailies -- amazingly, he was white in the color version that appears on the Comics Kingdom website, as well as newspapers that print the strip in full color. Crazy, huh? So -- the big thing that happens this week is Michelle and Jordan meeting. I've been wanting to throw these two together for some time. They are both ex-military, both "super achiever" types -- just seemed a natural thing to do. But how to get them together? Well -- Jordan can drop by Rex's office for a brief checkup, due to delays in getting in to see his specialist. But then -- we have an ethical issue pop up. It is seriously frowned upon for medical professionals to get romantically involved with their patients. So now we have some questions to ask and answer -- and a stumbling block in the way of a potential relationship. And we'll be dealing with that in future strips. Another week of B&W REX strips for the folks who otherwise only see the color versions. A reminder that while I color the Sunday strips, the daily color is done by someone else. The gray tones you see on the dailies here are my work -- and, as far as I'm concerned, are the official versions of the daily strips. This week reminds us that the Morgans are planning a move to a new house -- and presents the flip side of last week -- life and death -- both part of the ongoing experience of a medical professional. Some readers had trouble recalling the young mother we meet in these strips -- wondering when the drowning rescue sequence happened in the strip. The answer is -- it didn't. 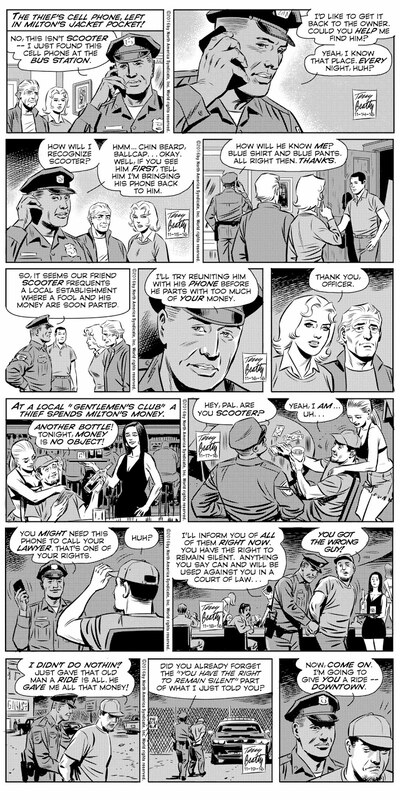 This is a event from Rex's life that was not recorded in the comic strip. In other words, I just wrote it -- a "continuity implant" I suppose you'd call it. But I figure not every incident in Rex's life had been recorded on the comics page. 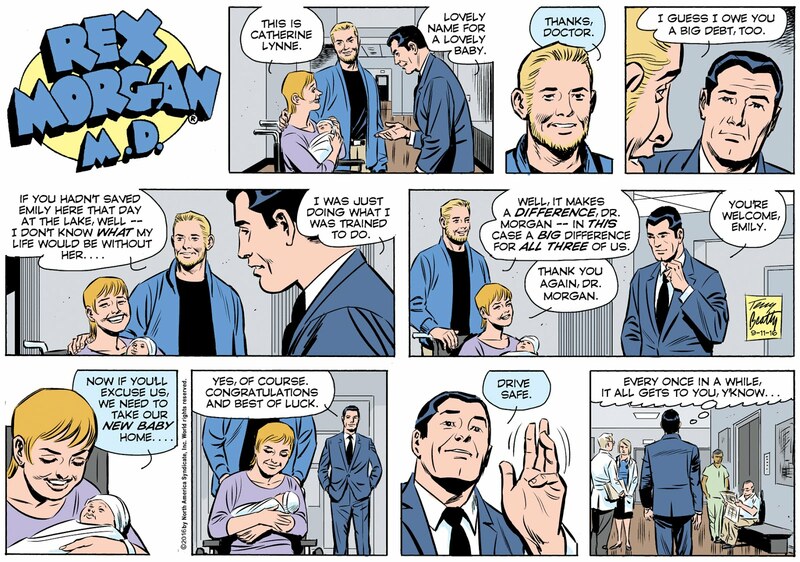 As the strip's new writer, I get to add to his history -- them's the rules. More REX. Milton slips deeper into dementia and Rex loses a patient. "Dropping in to answer some questions and concerns from those who are treating the strip's subject matter seriously today. I do have sources for medical advice -- one in my family -- and I do a good amount of research before touching on medical matters. That said, please don't expect too much detail here as regards medications and treatments. For a number of reasons, not the least of which is the limited amount of word space in a daily comic, I'm having to paint with broad brush strokes here. 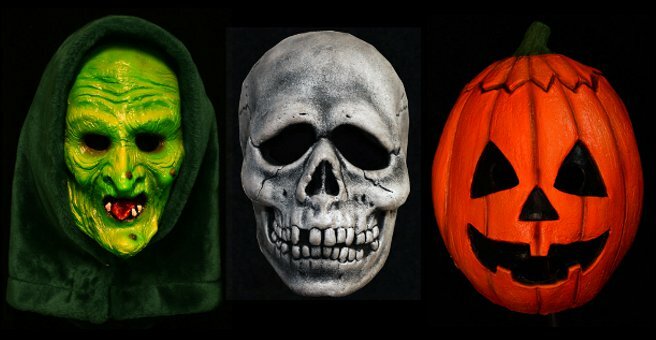 What you're getting are snapshots in the lives of these characters -- not every moment. One must also take into consideration the fact that writing a daily and Sunday comic strip is as much like doing a puzzle, as it is writing a story. There has to be a certain amount of repetition and recap, and things need to be presented as simply as possible to get the point across in two or three panels a day -- for readers who are often spending less than a minute reading the strip. I do take the subject of dementia quite seriously -- my mother suffered from it in her later years. We're not going to linger over Milton's illness in great detail. Let's face it, it's not exactly a picnic -- and what reader wants to see such tragedy here every day? That said, the next week or so is about the balance between tragedy and triumph in a doctor's life -- and you'll just have to read it to see what that's about. There is a follow-up to this Milton/Heather/Jordan situation coming in about two months. I won't say more, because the whole idea here is for you to come back and keep reading. No story spoilers from me! 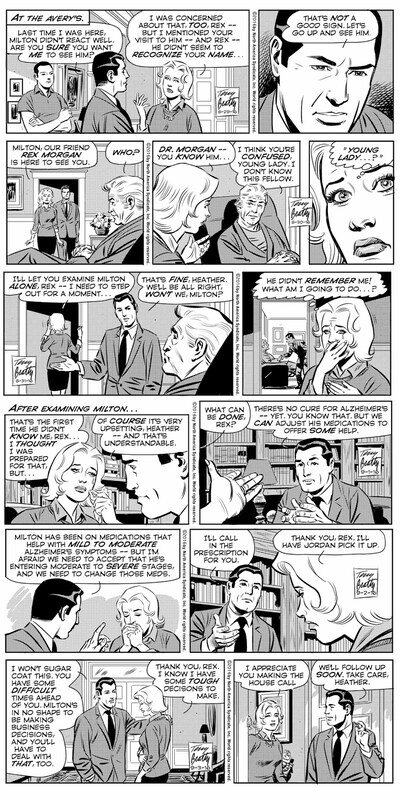 You can assume that Rex and Heather have had a far more detailed discussion of Milton's condition than we see in the strip. We present the highlights here, so we can move the story along. 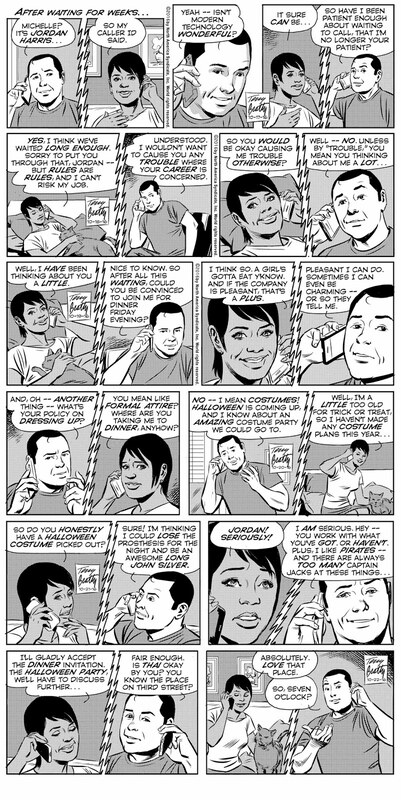 To play out the full conversation that would have happened would have eaten up weeks of strip time -- and that's not good comic strip storytelling. I have more in mind with Jordan, as you'll see in coming weeks -- and the reveal of the prosthetic leg was not something Woody had planned -- but something of a "retcon" of the character from me. In some ways it was, admittedly, a bit of a stretch -- but I felt the character needed more of a story, and this is part of it. As for Rex doing more doctor duty -- he will -- but remember, this is essentially a "soap opera" strip and not a medical lecture series. Rex's medical practice will tie into plots regarding friends and family -- think "Days of Our Lives," not "House." 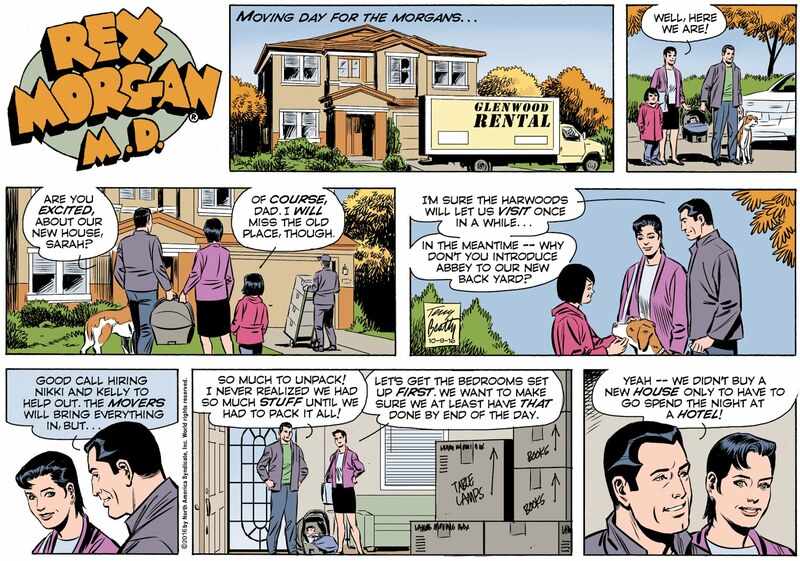 And with TWO kids in the Morgan household now, we'll be seeing a certain amount of family oriented strips that aren't necessarily plot heavy, but character based, as I'm trying to make all the characters -- yes, even the dreaded Sarah -- more relatable and likable. Yeah, I know -- big job there. Stick around." More complaints -- and to be fair, many compliments -- came with the Sunday page, but it seems trying to explain my motivations to the CK snarker crowd is fighting a losing battle. No matter what I say or do -- and I think I just did my best Sunday page ever -- there will always be those who show up only to ridicule and complain. 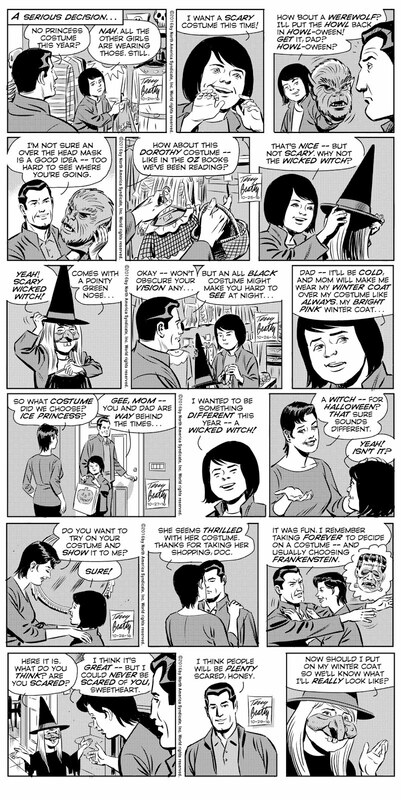 Those folks don't want to give any strip creator a break, and frankly, prefer the strips to be bad, so they can play the bully and poke fun. No thanks. That said, I'll gladly explain myself here, on my own turf. It's not standard operating procedure for a hospital to call a doctor in the middle of the night with the sort of update Rex gets in the Sunday page -- UNLESS said doctor has requested a staff member to keep him updated -- which is what I had in mind here. Because of the "snapshot" nature of comics storytelling, I wasn't able to spell out that background detail -- but I didn't think I needed to. The snarkers want to jump on anything they perceive as an error -- so they were all over the phone call -- and Rex's reaction to his patient's passing. When confronted with something that's "not how that is done," they don't bother to ask the simple question, "But is it possible?" And as far as I'm concerned, if it's possible -- even if it's not probable -- it's a valid story choice. As for Rex's response, I don't think it makes him unprofessional -- I think it makes him human. 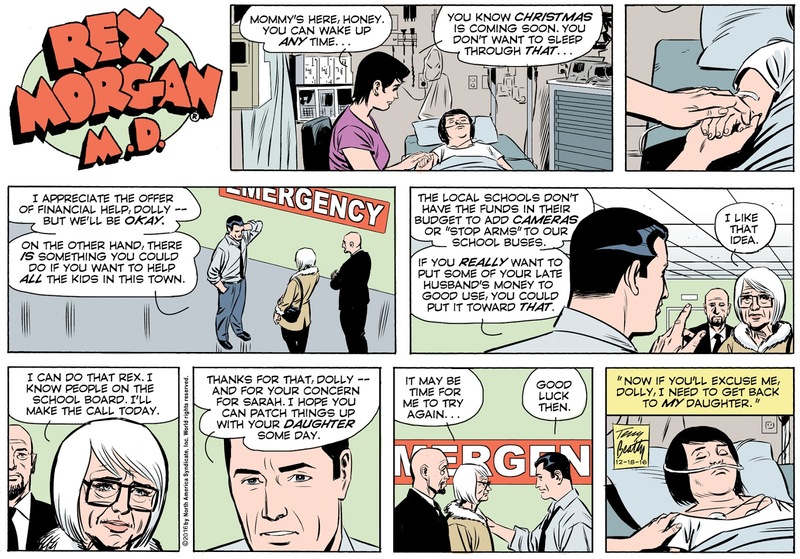 Yes, this is a long-time medical professional -- but Rex, my Rex, is a guy with a big heart -- and once in a while -- as he says in the Monday strip that follows these "It all gets to you." What the snarkers also fail to consider is that I might be setting up something that will pay off later -- stick around for the next week of strips and you'll see that. Now I keep reminding myself that the full readership of the strip far outnumbers the CK comment board snarkers who seem to live to gripe about it. Most folks read it, enjoy it, and go on about their lives -- as they should. Those of you who drop by here to see the B&W/toned version, seem to do so because you enjoy it -- and my Facebook followers certainly have been positive in their response. We have also not lost any newspapers with the switchover in writers -- and papers often take a shift in creators as an excuse to drop a feature. So I think I have a good perspective on the more typical response to my work on REX. The snarkers are an exception, and not representative of the average reader. I just find it unfortunate that they've so strongly taken over the comments section on CK -- keeping a real conversation about the strip from happening in favor of the eight-thousandth unfunny complaint that "Sarah has a big head" or "June is sore." Cartoonist, teacher, sculptor, illustrator -- proud father and grandfather -- owner of way too many books.